I found a local woman in the phone book who made wedding cakes, and arranged for her to do a two-tier chocolate cake with white icing. The icing was fairly plain, just rosettes and a little piping, since I did the final the decoration myself. Because I didn't get loads of decoration, the cake was surprisingly inexpensive (it was also really tasty, which is something of a rarity in wedding cakes). The cake toppers were Frankenstein's Monster and the Bride. They were actually a pair of salt shakers that I found on e-Bay. We used a silver dagger to cut the cake, but a simple silver cake knife with a black ribbon on the handle would certainly suffice. The cake stand was a plaster plant stand shaped like a gargoyle that I spray-painted black. Check with area craft shops for chipped or broken plaster sculptures; they might be cheap or even free, and the damage would make it look interestingly ruined. Paint it, apply a faux finish, or simply drape it with fabric. Even if you want a predominantly white cake, most standard cake decorators can add colorful flowers. Have rich red, purple, or black roses scattered around the cake, along with dark greenery. If you find a more creative cake decorator, have them pipe spiderwebs or bats all over the cake. 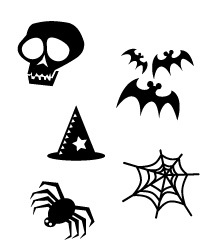 Use marzipan decorations--either harvest items such as pumpkins, apples, wheat sheaves, and autumn leaves, or specifically Halloween decorations like skulls and bats. Marzipan World has some fantastic ones. 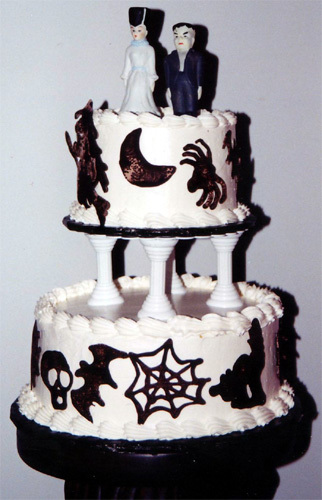 For the cake topper, look for Nightmare Before Christmas figurines (Disney used to carry some; check eBay for secondhand figures) or Beetlejuice cartoon figures (these are no longer in production, but might be found on eBay as well). Other gothy figurines would be cats, bats, dragons, and fairies. 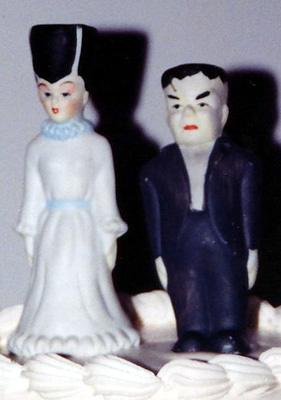 You can also take traditional Bride and Groom caketop figures and give them a gothic makeover. Paint their clothes in dark colors, and paint on gothic makeup and hair. There are also many companies who will create custom portrait caketop figurines (although these are usually quite costly). Mexican "Day of the Dead" figures come in a ridiculous array of "professions," including brides and grooms. They tend to look a little too campy for my tastes, but they'd be fantastic as part of a Dia de los Muertos-themed celebration. Instead of a full-size cake, serve individual "lava cakes" (which have a liquid chocolate interior). Use a white cake batter for the cakes, dyed with a bit of food coloring to a fleshy pink. Add a little powdered red food coloring along with the chocolate center, and you should have cakes that ooze blood when your guests cut them open. Here's a photo of a simply gorgeous "Corpse Bride" cake that was e-mailed to me. (I originally didn't have an attribution, but the designer recently tracked me down: This was created by Holly's Cakes LLC, and the base icing is buttercream.) The cake itself would be fairly easy to replicate: White icing spiderwebs and dark chocolate glaze (the photo looks like the chocolate may have been dyed black).